Kemenkumham - Kementerian Hukum dan Hak Asasi Manusia Republik Indonesia or the Ministry of Justice and Human Rights is a ministry of the Government of Indonesia in charge of legal affairs and human rights. The Ministry formerly known as Departemen Kehakiman or Department of Justice (1945-1999). 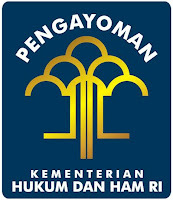 The name of Kementerian Hukum dan Hak Asasi Manusia (Kemenkumham) was launched in 2009. The Ministry headquartered in Jakarta and situated in Jl. HR. Rasuna Said kav 6-7 Kuningan Jakarta Selatan. Kemenkumham supported by 33 regional offices in all over Indonesia. The Ministry also supported by Secretary General, the Inspectorate General, 6 directorate general, and 3 agencies. For detailed information about job requirements and to apply online, please refer Apply from Kemenkumham on following link below. Online registration opened on 18 March 2013 and closed on 22 March 2013. The entire stage of this selection process is free of charge.